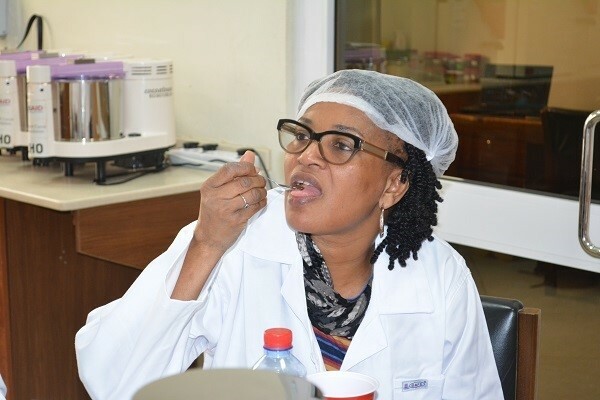 In recognition of the importance of flavor in cocoa, the World Cocoa Foundation (WCF) has helped establish flavor laboratories at the Cocoa Research Institute of Ghana (CRIG) and at the National Agronomic Research Center in Côte d’Ivoire, as well as a sensory panel to analyze the flavor of cocoa. 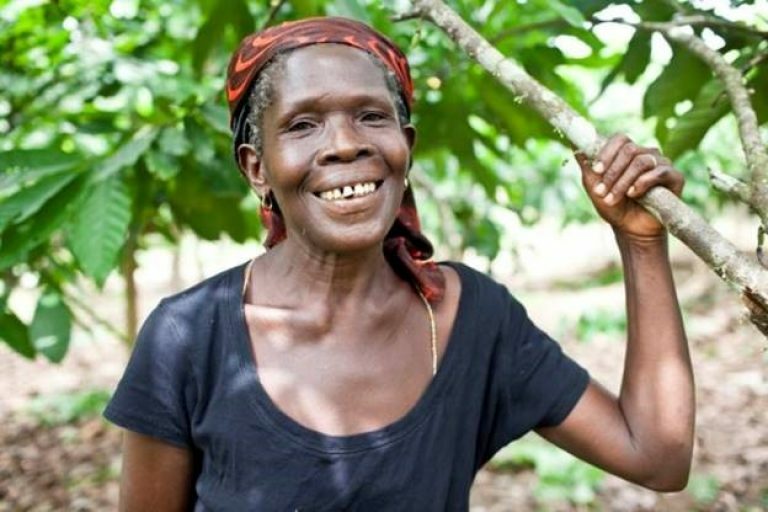 Farmers and cooperatives are now being trained on best agricultural and post-harvest practices for producing high quality cocoa. I participated in a training session at the CRIG flavor lab aimed at building the capacity and understanding flavor quality in August 2018. 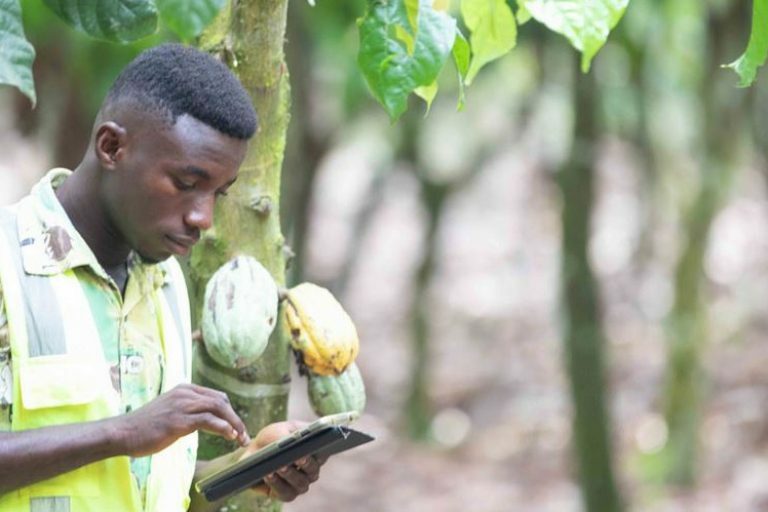 This blog post shares my perspective on how GAP (Good Agricultural Practices) training and flavor management may help maintain cocoa’s traditional rich flavor in Ghana. 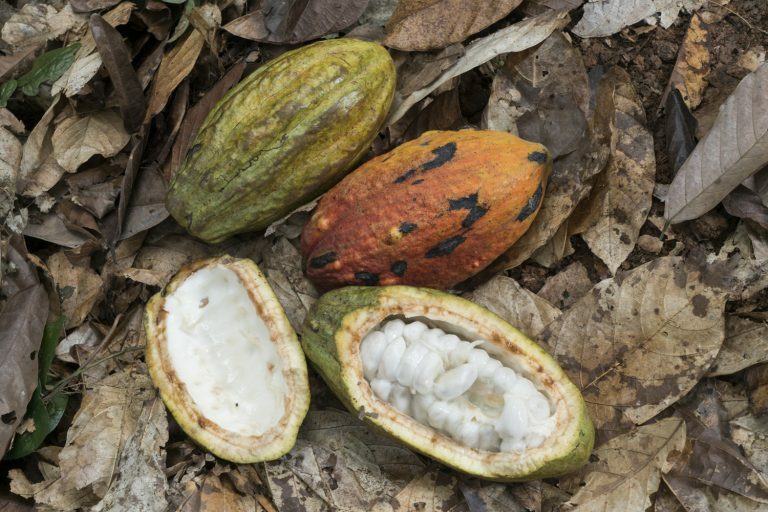 What Constitutes Post-Harvest in Cocoa and Why is it Important? During my training, I learned about the wide range of activities and practices that influence flavor quality, including pod breaking, where the use of wooden clubs enhances efficient removal of the beans. I also learned that allowing harvested pods to rest for two to four days before pod breaking enhances effective fermentation by facilitating the breakdown of complex sugars into their simpler forms. I learned that fermentation should last six days, with the fermentation heap turned every 48 hours, to allow both the aerobic and anaerobic fermentation to take place properly. 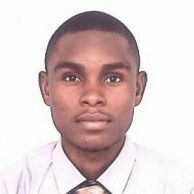 I was also educated on tray, box, and basket fermentation methods that can be used depending on the heap, and weight of beans. Proper drying of fermented cocoa on raffia mats rather than polythene sheet and other materials or on surfaces that do not allow aeration of the drying beans will affect the flavor of cocoa as well. Finally, proper storage is key. Beans should be packed in appropriate jute bags or baskets and stored in a clean, odorless place to maintain good flavor. Bean quality analysis after cutting through beans with a guillotine. Is There a Need for Improved Flavor Quality? WCF’s Virginie Mfegue appreciating flavor during the sensory evaluation session. 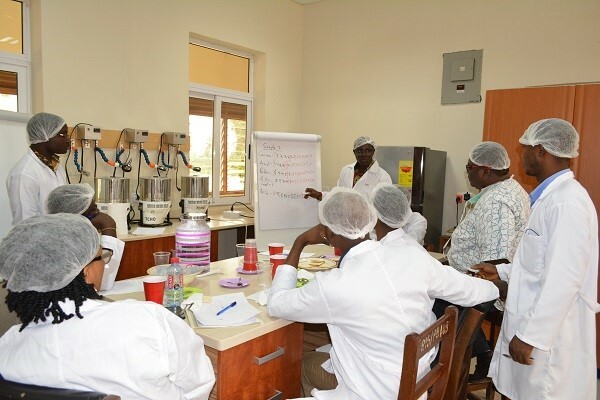 I am very excited to be part of the innovative thinking around flavor and to see Ghana making more investments and partnerships with WCF and its member companies to maintain and improve the flavor quality of Ghana’s cocoa. I hope more farmers will be trained on GAP and on how to improve their post-harvest practices to ensure good bean flavor. I also look forward to this training being extended to other West African countries such as Côte d’Ivoire. 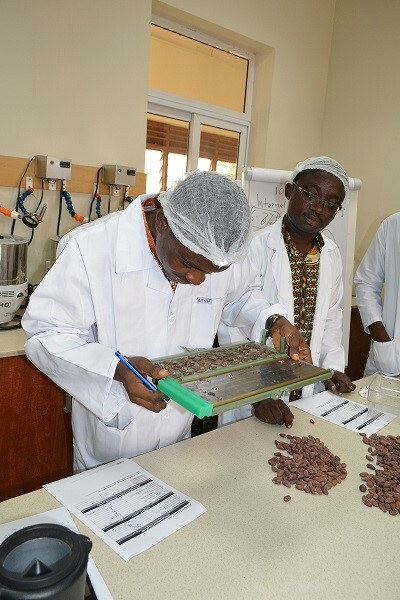 We hope that many West African farmers will follow in the footsteps of Simon Marfo: this Ghanaian farmer, trained at the CRIG flavor lab in 2013, won an International Cocoa of Excellence Award at Paris’ Salon du Chocolat in 2017! ACI II team listening attentively as Stephen explains the reasons for variations in samples after the tasting. *WCF member companies supporting the African Cocoa Initiative at the time of the flavor lab’s inception were ADM Cocoa; Barry Callebaut; Blommer Chocolate Company; Cargill; Continaf BV; Ferrero; Guittard Chocolate Company; The Hershey Company; Lindt & Sprüngli; Mars Wrigley Confectionery; Mondelēz International; Nestlé; Noble Resources; and Olam International Ltd. TCHO served as a technical partner to WCF for the flavor lab portion.